Cornell researchers have demonstrated a new strategy for making energy- efficient, reliable nonvolatile magnetic memory devices — which retain information without electric power. Reported online in the journal Science May 3, the researchers use a physical phenomenon called the spin Hall effect, that turns out to be useful for memory applications because it can switch magnetic poles back and forth — the basic mechanism needed to make magnet-based computer memory. The Cornell researchers discovered that the spin Hall effect in the metal tantalum can be twice as strong as in any material investigated previously, and it can provide an efficient new way to manipulate magnetic moments. The Cornell device could give the leading nonvolatile magnetic memory technology, called the magnetic tunnel junction, a run for its money. “The spin Hall effect is interesting because it’s a bit of physics people haven’t paid all that much attention to using in applications,” said Dan Ralph, the Horace White Professor of Physics, member of the Kavli Institute at Cornell for Nanoscale Science and the paper’s senior co-author with Robert A. Buhrman, the J.E. Sweet Professor of Engineering. Ralph is one of the leaders of the interdisciplinary research group Mechanisms, Materials and Devices for Spin Manipulation with the National Science Foundation-funded Cornell Center for Materials Research (CCMR). The spin Hall effect works like this: In a heavy metal like tantalum, electrons with intrinsic spins pointing at different angles (electrons, in quantum mechanics, spin like a top) are deflected sideways in different directions. Consequently, a charge current produces a net-sideways flow of spins. This spin current can be absorbed by an adjacent magnetic layer, applying a torque to flip the magnetic orientation. 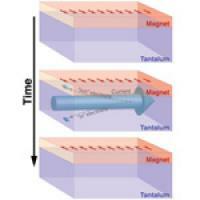 The magnet stays in place even when no current flows, making the memory nonvolatile. Currently, the leading technology for developing nonvolatile magnetic memory devices is the magnetic tunnel junction, which consists of two magnetic layers sandwiching a thin barrier. When an electrical current passes perpendicular to the layers of a magnetic tunnel junction, one magnetic layer polarizes the electrons, acting as a filter to produce a spin-polarized current. The next layer can absorb this spin current and receive a torque to flip the magnet. A disadvantage to magnetic tunnels junctions is that the same current path is used for both reading and writing information, making it difficult to pass enough current through the device to achieve magnetic switching without occasionally damaging the barrier layer, Ralph said. The Cornell researchers’ new design uses different pathways for the reading and writing, which is slightly less space efficient, but with as good or better results for switching efficiency and overall reliability. The paper’s co-authors are graduate students Luqiao Liu, Chi-Feng Pai, Y. Li and H.W. Tseng. The research was supported by the Defense Advanced Research Projects Agency, Office of Naval Research, National Science Foundation/Materials Research Science and Engineering Center through CCMR and the Cornell Center for Nanoscale Systems.